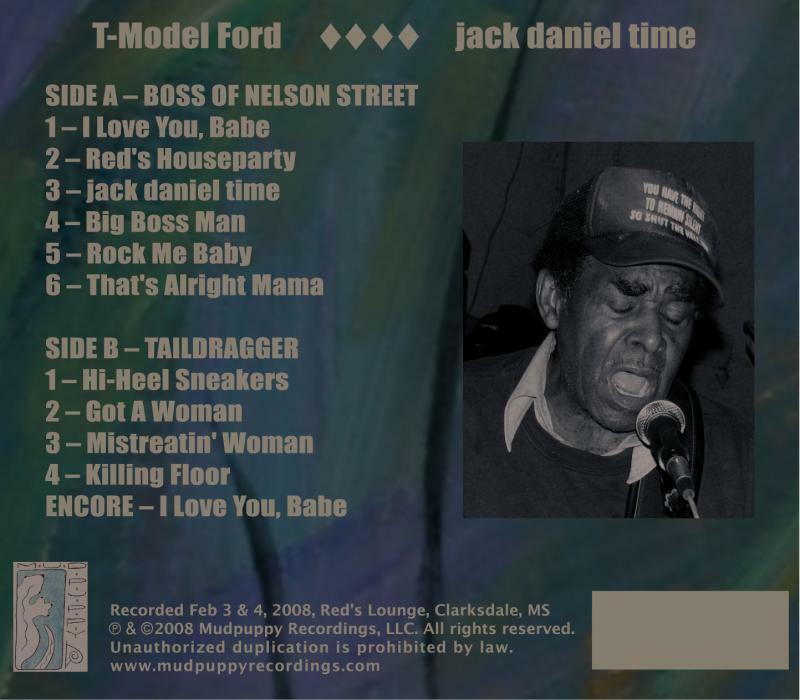 Mudpuppy Recordings, LLC - T-Model Ford "jack daniel time"
"Fans of the downhome, ragged blues of the Mississippi Delta will absolutely love this one." 80-some years of hard livin’ and lovin’, fightin’ and cuttin’ has led to this: a brand new album of whiskey-soaked blues on a brand new label - the man they call “T-Model Ford” on Mudpuppy Recordings. T-Model (a.k.a. The Taildragger) hails from Arthur “Big Boy” Crudup territory in Forest, Mississippi. He spent years in Clarksdale and currently resides in Greenville, Mississippi. Through his long and storied life, T-Model has been married five times, survived a stint at Parchman Farm and served two years on a Tennessee chain gang. He’s also played a bit of blues along the way and is as likely to be found playing huge European festivals as he is harassing the ladies at his favorite juke joint, Red’s Lounge, where this CD was recorded (live to tape with no overdubs). Joining T-Model on “jack daniel time” is Terry “Harmonica” Bean – now in his late forties – who started his professional blues career backing up T-Model but quit him after one too many fights broke out at their gigs. Drummer Lee Williams is a veteran of the Clarksdale blues scene and another regular at Red’s. On hand as a very special guest was one of T-Model’s first drummers (and ex-Jelly Roll King), the legendary Sam Carr. In between band sessions, T-Model also took time to play a few solo acoustic numbers – his first non-electric recordings ever. The session, itself, was predictably chaotic with rain occasionally finding its way through the leaky juke joint roof and on to the drum set and assorted electronics, but the Taildragger’s spirit never dampened. After all, as T-Model (and Mudpuppy Recordings) will tell you, it’s “jack daniel time”! SPECIAL BONUS: This CD is conceived and organized in the two-sided record album tradition and is pressed on black plastic "vinyl” for vintage look. DOMESTIC (USA) CUSTOMERS CLICK THE PAYPAL BUTTON DIRECTLY BELOW. International customers must use this PayPal button. 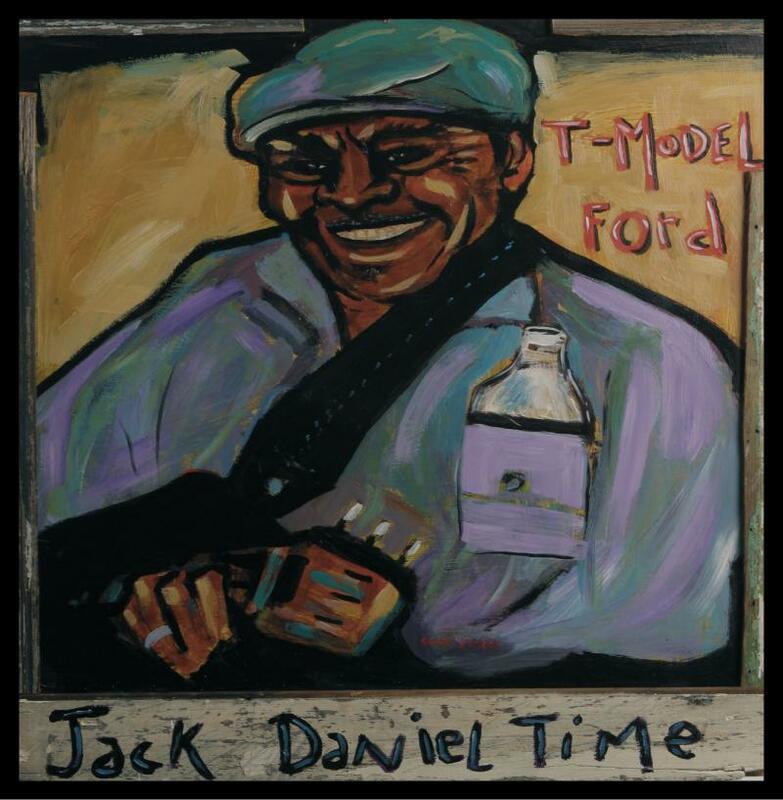 To purchase a print of the "jack daniel time" CD cover picture of T-Model Ford, and/or to see more by this fantastic artist visit www.stanstreet.com. The painting is based on a photo by renowned music photographer Joseph Rosen, www.josepharosen.com. Mudpuppy thanks the artists on "jack daniel time" - T-Model Ford, Terry "Harmonica" Bean, Sam Carr, Lee Williams, and Bill Abel. Thanks also to Bill Abel and crew for sound engineering and Mike Burkey for mastering.